1. If you’re trying to attract Millennials. Produce a series of videos that tells the stories of young people who have taken on big tasks and/or advanced in your company. 2. If you’re about executive leadership. Then allow staff to write questions that the executive team answers on camera every quarter. 3. If you’re trying to hire in a difficult location. Make videos that showcase the lifestyle and benefits of your area. 4. If you want new hires to fit the company culture. Documentary style video showing a day in the life is a great way to communicate company culture in a real and authentic way. 5. If you want to retain staff. Then produce monthly or quarterly recognition videos that showcase staff who exceed expectations or who are unusually successful or who help define your company culture. 6. If you want to attract recruits with a specific skill set. Create short videos that describe the skill set you’re looking for and how those skills will be put to good use. 7. If you want to save the HR staff time. Don’t forget that video can help with orientation. A small video team can record on the orientation essentials or an editor can animate your orientation slides in an engaging way. 8. If you wan to increase staff productivity. Create the videos for training staff can help new hires get up to speed quicker or help you manage a change in procedure across the company. 9. If you want to promote health & safety. And who doesn’t, huh? Being proactive here on social, not only may prevent needless injury or damage, it also sets the tone that you care about your employees and staff. 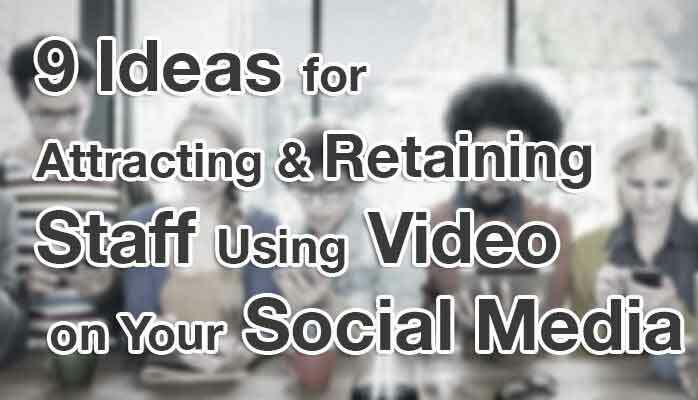 If you’re looking for a video team to help you implement these ideas — or any other idea for engaging your work force — Call (914) 222-3346 or Get a Quick Quote Online Today. Today’s employees are remote, networked, and highly engaged in video communication.